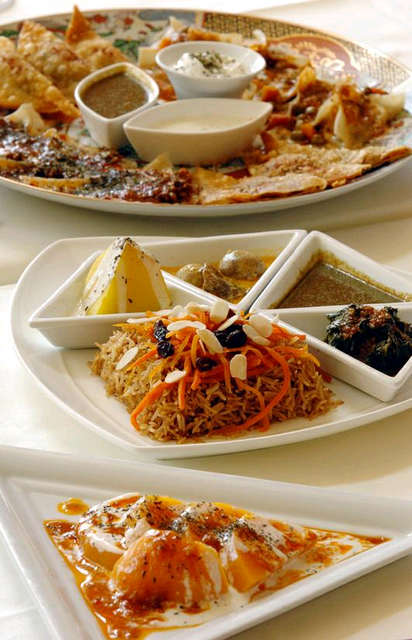 Afghan cuisine is a rich blend of various influences that make a distinct and delectable taste of their own. While home to over 20 different ethnicities, historically, Afghan food owes its main influences to three major ethnic groups: the Pashtuns, the Tajiks, and Turkic groups such as the Uzbeks and the Hazaras. Although food may vary between regions, similarities exist. Fresh yogurt, cilantro, garlic, onions, scallions, tomatoes, potatoes, and fruit are widely available in all parts of Afghanistan. Fruits, fresh and dried, form an important part of the Afghan diet, especially in rural areas. Afghanistan produces exceptionally high quality fruits (notably melons, watermelons, grapes, pomegranates, peaches, apples, pears, mulberries, figs, persimmons, apricots, plums, and beyond) that have traditionally been the country’s main food exports. Dried nuts and seeds, such as walnuts, pistachios, almonds, and pine nuts are very popular and plentiful. Exceptional varieties of oranges, known locally as “malta,” are grown in the warm climate of Nangarhar province. When available, meat, preferably lamb or chicken, is widely consumed. Afghan cuisine emphasizes well-balanced tastes and food should be seasoned, but many non-Afghans are surprised to find that it is neither spicy nor hot. 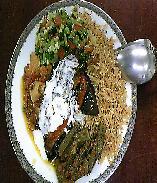 Afghan meals are traditionally eaten while seated on the floor. Large colorful cushions, called “toshak,” are spread out on carpets and a large cloth or thinmat (disterkhan) rests on the floor. Food may be served outside or under a tree on a summer day. In winter, the “sandali,” a low table covered with a large duvet (liaf), traditionally used to warm legs, is often the center of a meal. A charcoal brazier (manqal), which has to be thoroughly burned in advance and covered with ashes, is situated under the table when using a sandali. Traditionally, food is eaten with the right hand, without cutlery. Before a meal, diners are provided with an "aftabah wa lagan," (usually by a young family member), a copper basin and elaborate pot filled with water, for diners to wash their hands in. 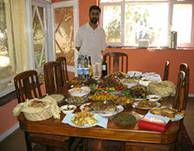 After preparations are made, breads, accompaniments, relishes, appetizers, main courses, salads, rice, and fruits are brought out to fill the destarkhan. There is no special order in which food is served. Usually at a large party the table is set with all the main dishes placed together with the desserts and fruit. However, in practice the desserts and fruit are eaten last. As hospitality is valued among Afghans, guests are given the place of honor at the head of the room and receive tea first. Food is usually shared communally, but the arrangement calls for special attention as guests must have easy access to the specialties. Naan: not-so-thin, long (50 cm) oval shaped bread made mainly of a blend of white and whole wheat. 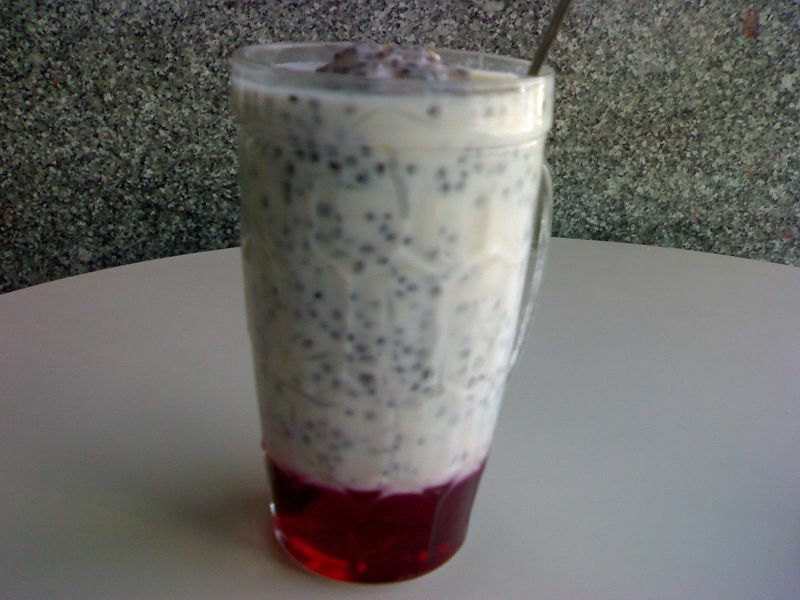 Naan is commonly topped with poppy seeds, sesame seeds, nigella seeds, or some combination of these. Naan-ejawari is bread made from corn and naan-ejao from hops. Nan-e-Uzbeki is an Uzbek-style bread and is shaped like a disc, at times thicker than standard naan; it is usually made with white flour. 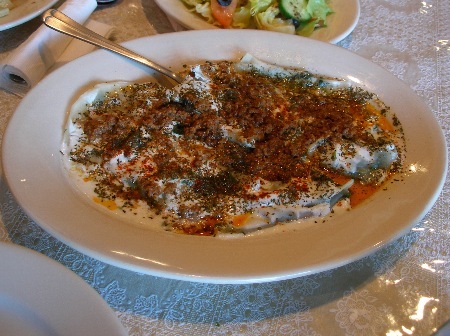 Lavash is a very thin bread and is usually used as plating for meats and stews. 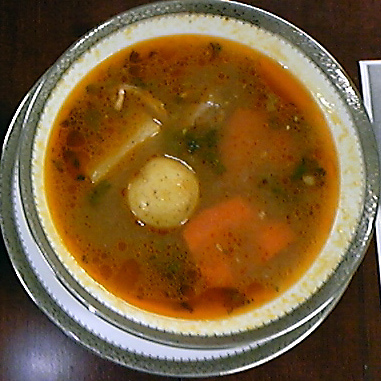 Various pickled fruits (such as peaches and lemon) and vegetables (such as baby eggplant, carrots and garlic) mixed with vinegar and spices. Chalau and Palau: Extra long white rice such as Basmati are used to make Chalau. This dish is first parboiled, then drained, and finally baked in an oven with oil, cumin seeds, and salt. This method creates a fluffy rice. Palau and Chalau are prepared such that the rice grains do not stick together. Palau is prepared in the same manner as chalau but meat and stock, qorma, herbs, or a combination are blended before the baking process. This process brings forth the elaborate colors, flavors, and aromas that give some of the rice their names. Examples of palau dishes include Qabeli Palau (cooked with meat and stock, Qabeli Palau is topped with fried raisins, slivered carrots and pistachios), Zamarod Palau (Spinach qorma mixed in before baking, which gives it an emerald or “zamarod” color), Shibit Palau (Fresh dill and raisins), and Maush Palau (Sweet and sour vegetarian palau baked with mung beans). Sticky rices (bata) are made by boiling medium grain rice. The sticky texture is the result of not draining the water. Sticky rice is often prepared with meat, herbs, and grains. 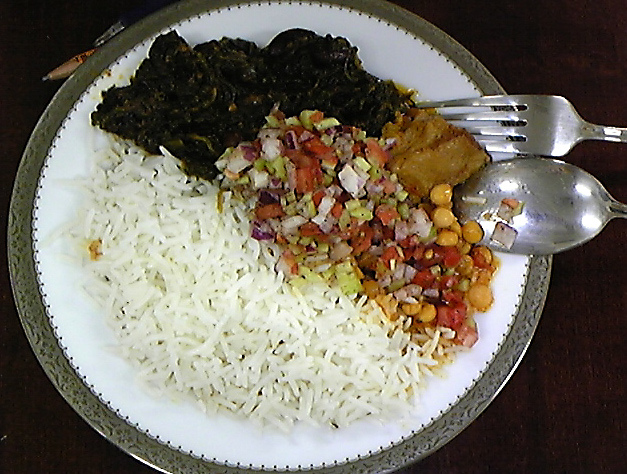 It is usually eaten with a qorma, such as Sabzi (spinach) or Shalgham (turnips). Other notable sticky rice dishes include Mastawa, Kecheri Qoroot, and Shola. Most qormas are onion-based. Onions are fried and then meat, spices, minced garlic, vegetables and some fruits are added. Finally, after the addition of water, the dish is allowed to simmer. The onion crystallizes and creates a richly colored stew. Some examples of the over 100 variations of qormas are: Qorma Alou-Bokhara wa Dalnakhod (onion based, with sour plums, lentils, cardamom, and veal or chicken), Quorma Kofta (onion and tomato based sauce where ground mutton or beef meatballs simmer), and Quorma Sabzi (sauteed spinach and other greens with lamb). Kababs are most readily available outside the home, in restaurants and outdoor vendor stalls. The most common meat used is lamb, and fat from the tail (jijeq) is usually mixed for extra flavor. Afghan kababs are generally seasoned in onion juice, garlic and salt and served with naan; serving kababs with rice is rare. Sumac, locally known as "ghora-e-angoor,” is generally made available to customers to sprinkle on their kababs. Other popular kababs include lamb chops, ribs, kofta (ground beef), and chicken. 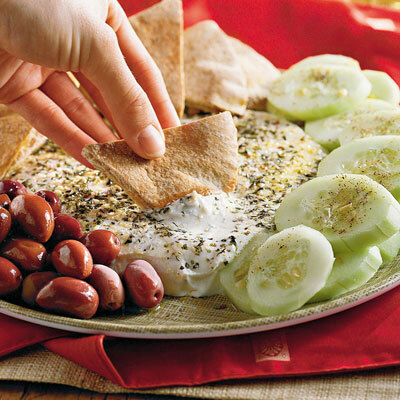 Qoroot: Similar to a mixture of yogurt and sour cream, but is saltier, thicker, and with a more pronounced sour taste. It is always served to enhance the main dish as an accompaniment. 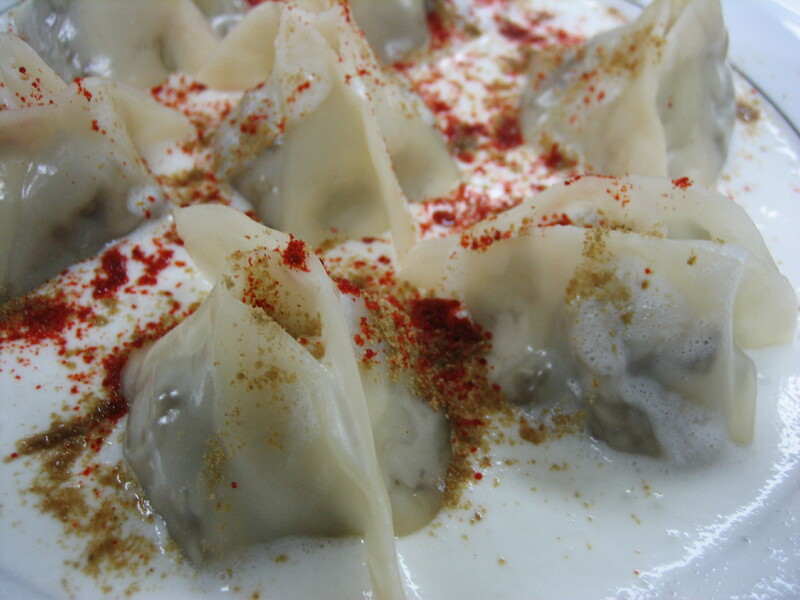 Originally an Uzbek dish, Mantu are steamed dumplings filled with onions and ground beef. They are often topped with a spicy tomato-oil sauce or a garlic-coriander qoroot. Typically a mix of spiced potatoes, onion, peas, and coriander in a fried triangularly shaped pastry shell. 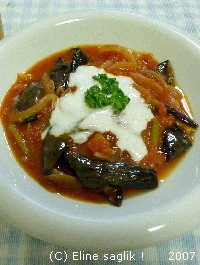 Seasoned eggplant that is pan-fried and simmered in a cooked tomato-base sauce and served with fresh mint. Yogurt sauce may also be used as an accompaniment. 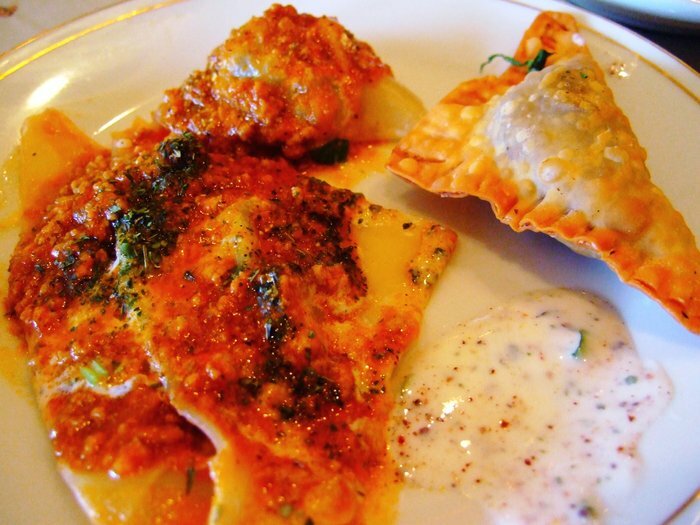 A Kabul dish, Ashak are boiled dumplings filled with leeks and often topped with garlic-mint qoroot and a seasoned tomato-base ground meat mixture. 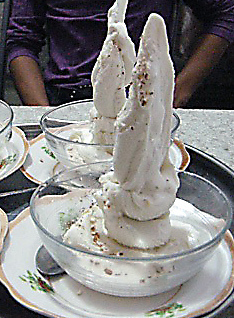 A type of cold dessert, similar to Italian ice, made with noodles. It is exclusively made in spring and early summer. 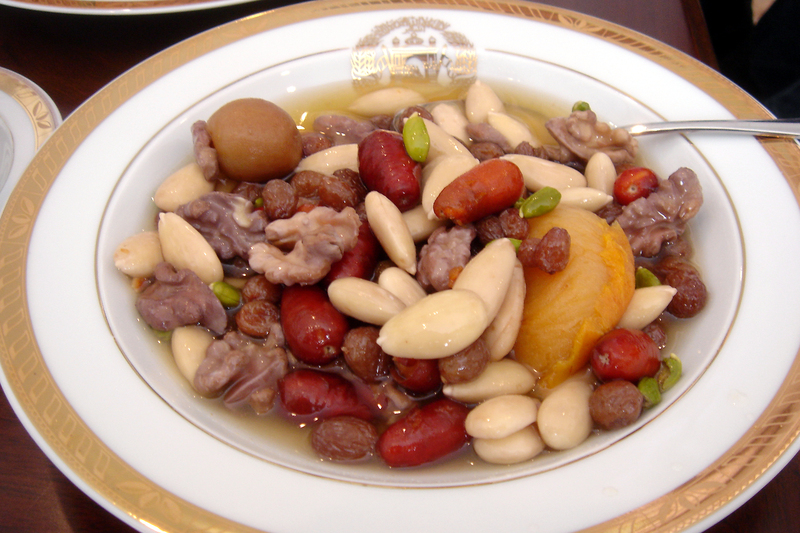 This dish is served with a variety of accompaniments ranging from milk custard thickened with salep, mountain snow, and rosewater.